“Forecasting drug sales is a tricky business; just ask any biopharma CEO who has overpromised and under-delivered.” Read more about the top 20 drugs expected to top the worldwide ranks in 2020, as analyzed by the market research and consulting firm EvaluatePharma. They range from sales at the high end of $15.92 billion for Humira, to $4.04 billion at the low end for newcomer HIV-fighter Triumeq. Generic drugs are usually significantly cheaper than brand-name drugs. 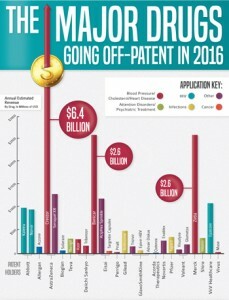 Here’s a look at 10 drugs coming off patent in 2016. And, although the FDA hasn’t yet approved generics for many of the blockbuster drugs coming off patent this year, in most cases there are generics in the pipeline, according to Dickson Data Blog. Many thanks to those from nearly 40 companies who participated in the 2016 Annual Employer Benefits Survey! Now in its sixth year, this unique online Survey offers invaluable strategic and tactical plan design details, along with insight into health plans, prescription drug trends, wellness programs, market innovations, and more. All participants are invited to join us for a meeting on March 30 to go over the results in detail. Click here to learn more. 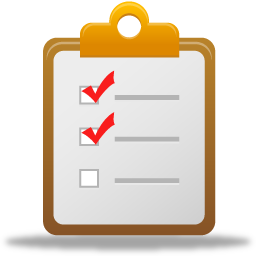 If you would like to be contacted about participating in the 2017 Survey, please contact Pat Sukhum. Join Us for the 9th Annual Employer Leadership Summit: Early Bird Special Available! Registration is now open for The Action Group’s 9th Annual Employer Leadership Summit on April 22, 2016: Turning Vision Into Action. Among the topics will be emerging Minnesota health care companies, how La Crosse, Wisconsin became the nation’s leader in advance care planning, ongoing health care purchasing challenges, and a panel discussion about The Action Group’s unique Care Delivery Learning Networks. We will feature national and international health care and benefits thought leaders, interactive polling, networking opportunities, sponsored booths, and lively discussions. Take advantage of the Early Bird Special, through March 25. The event was sold out in 2015! There are a few booths left for sponsors. If you or a partner organization would like to sponsor an exhibit, please contact us! Through its Specialty Pharmacy Care Delivery Learning Network, The Action Group is addressing the tremendous cost of specialty drugs. 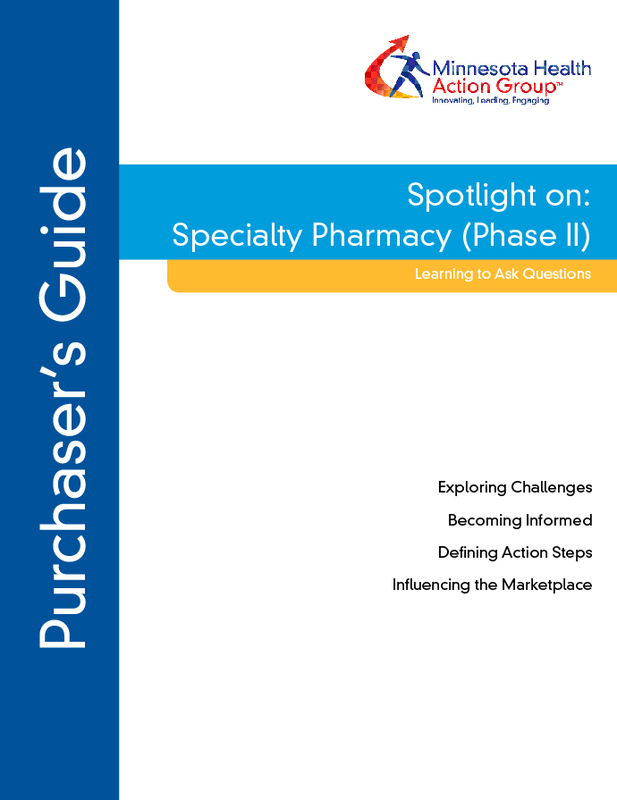 All Action Group members are invited to gather to review the Phase II Specialty Pharmacy Purchaser’s Guide on March 9 – and all will have online access to the Guides through the Member Center. Click here to learn more or to register. Despite incredible advances in medicine, human beings experience a 100 percent mortality rate. When David Bowie died in January, the floodgates to discussing end-of-life planning were opened. According to a story in The Mirror (U.K.), David Bowie “was a man who liked to be in control of his life, his career, and his legacy. So of course it makes sense that he has been in control of this too.” In 2015, The Action group began exploring how to open conversations about advance planning and end-of-life care, which will also be featured during the Employer Leadership Summit in April. As a follow up, tools and resources (e.g., lunch-and-learn presentations, FAQs, Fact Sheets) will be created for Action Group members later in the spring. For more information, contact Carolyn Pare. Michael Thompson, a principal for PricewaterhouseCoopers LLP (PwC), has accepted the position of president and CEO of the National Business Coalition on Health. At PwC for the past 20 years, Thompson is a national thought leader for business health strategies and health system reform. Read more here. The Action Group is a long-time member of NBCH, and our members benefit through event discounts, access to Action Briefs on a variety of topics, and unique networking opportunities. Learn more about NBCH here.